Part casually hip restaurant and rum bar, part gourmet coffee bar, and part waterfront concert venue, Watermen’s Bar and Grill really seems to have something for everyone. With comfortable seating inside or out on the picnic tables on their giant deck, just above the waterfront lawn, there’s plenty of space to enjoy a meal or let the kids run around, and the sunsets over the Pamlico Sound are nothing short of spectacular. 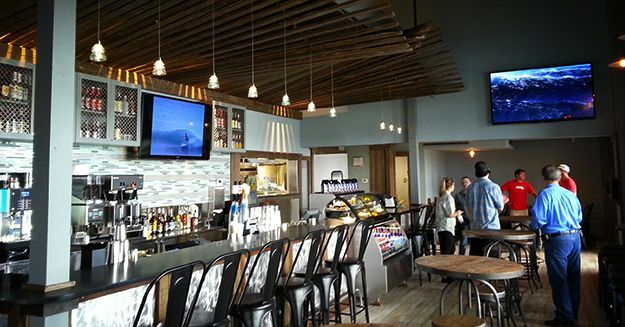 Watermen’s Bar and Grill debuted May 18, 2013 as a full-size restaurant serving freshly prepared, made-from scratch food with a focus on local ingredients and a high level of customer service. Produce is locally sourced, the fresh seafood is local, North Carolina craft beer is always on tap, even the coffee is locally roasted just days before it’s brewed. Morning starters include breakfast burritos, Umpqua oatmeal and fruit smoothies. For lunch try the blackened local tuna sandwich with wasabi cream sauce or the lump crab quesadilla. For dinner, one of the most popular menu items is chef Devon’s Carolina pork BBQ Ribs, or try one of the many local seafood specialties. The food isn’t the only thing that’s authentic about this place, the reclaimed hardwood used throughout the space spent its last 100 years as the Coney Island Boardwalk before being salvaged and incorporated into the restaurant. Owner Trip Forman tells the story of how past patrons have been delighted to find out that the bench they were sitting on was the made from the very same boards they walked along on their first date years before. Even the lighting has a story, delicate fixtures over the bar are actually antique telephone pole insulators that were drilled and made into custom pendant lights. Don’t let the good looks of the furnishings fool you though, all of the materials are hard-wearing and were chosen to withstand whatever the day brings. For Watermen’s that could be anything from large family groups who have just made the drive from as far away as Canada to throngs of hungry surfers and kiteboarders in wetsuits stopping in for a quick meal before their next session. For that same reason the tables are movable and can be completely removed to accommodate large crowds for concerts during their world-famous kiteboarding tourmanents. Serving breakfast, lunch and dinner, you can catch live music every week on the waterfront deck outside. Stop by tonight for their Saint Patrick’s Day concert with Christian Benedi playing acoustic beach rock and Irish Tavern drinking music starting at 6. Their Family Friendly Sky Blue Summer Concert Series sponsored by Carolina Brewery kicks off in April with most shows offering FREE admission and lasting from 6-10. Watermen’s Bar and Grill is located on the sound in Waves, just behind REAL Watersports.